Not every web host is perfect. For the same reason, you may face website downtimes. As a blogger, you can’t afford downtimes given that a huge sale can happen at any moment. We can’t always sit behind the admin panel of our site and cannot monitor website uptime manually 24/7. Hence, we can’t get to know when it goes offline. If you get notified about the downtime, you can think about how to overcome the adversity either by contacting the hosting provider or changing the company. But how can you get notified about your website downtimes? Well, I have crafted this post exactly for people like you. In this article, I am going to share ten of the best website uptime monitoring services with you. If you don’t know, there are dozens of such services available on the web. I handpicked all the items listed in here. In short, you get the best. Before we get into the core of this article, I want you to share a few reasons why you should monitor your site. If you want to get uptime monitoring service, you can skip to the next section straightaway. In case you aren’t convinced about the idea of monitoring the uptime of your site, you must read this section. There are thousands of teeny-tiny things that can break your site. If you are a WordPress user, a wrecked update can break your site. Even after the successful update, a theme incompatibility or issues with a plugin can cause a problem. When you post an article, and it goes viral, the outrageous number of visitors can make your site offline. The hardware errors are fatal to shatter your site. Moreover, even a single error you make while editing the core PHP files of your site is capable of challenging the uptime. That’s why you must be cautious about the downtimes. As I said earlier, we can’t always sit in front of the computer, checking the uptime status of our websites. For the same reason, it is impossible to know when it goes down as well. Even if we come online, our site may not be the first time we look up to. In internet marketing, a big sale or a traffic outburst can happen anytime. So, you have to prepare for that. When your site goes offline, your revenue drastically goes down. And, you will suffer a lot of loss. If you get notifications about your website downtime on the first place, you can fix the issue. By this way, you will not have to face more loss. As a website owner, you must be reliable. If your site goes down often, you won’t have any regular visitors. People bounce back from your site. If you get notified about your site downtime, you can work on it to bring things back to normal. Given that your site doesn’t stay offline for a lot of time, you won’t lose your credibility. When it comes to internet marketing, trust is an important selling factor. You will get a lot of sales as you generate trust factor in your audience. A single downtime can cause all trust you achieved over time. Yeah, you read it just right! What is an insurance policy used for? To cover accidental damage, isn’t it? Web monitoring works for the same purpose. Whenever your site goes down, you will face damage in the financial part. The real-time notifications help you understand your site’s critical condition. So, you can work on the issue to bring it back to online. Even though site monitoring tools doesn’t give you any money, it makes sure you lose nothing. You know what? A 1% downtime means three days in a year. If you are an internet marketer who targets any specific events like Black Friday or Cyber Monday, you will face fatal damages. That’s why you must know when your website goes offline. You can solve the issue without allowing it to be contagious. A website monitoring service gives you real-time notifications to help you get updated. You can set different notification delivery methods (email, SMS, etc.). No website can stay without going down at least for a few minutes. Whenever your web hosting provider does server migration or any maintenance going on, you will face downtimes. You may find it silly! But it is a significant fact that points out the necessity of using a website monitoring service. Let’s say something went wrong with your site that it is facing downtime. Over the time, people keep on visiting your site and find it unavailable. Chances are less for you to get the same individuals to your site again. What if you get a real-time notification about your site going down? You can take the necessary step to bring it back to life. As you make everything healthy, not many will be able to know about your website downtime. You keep your credibility, and you will not lose your regular audience as well. So, you have read six benefits of monitoring the uptime of your site. The list hasn’t ended. You will get tons of advantages from monitoring your website for the downtime. But I am not going to mention all of them here. I know you are becoming impatient. So without further ado, let’s get directly to the core of this post. The following are the best service to monitor website uptime, I have found online and some of these I am using currently. Even though the mode of functioning is different, the primary motive is the same. The very first website uptime monitoring service here is UptimeRobot. The service remains affordable and functional. Both free and premium plans are available with UptimeRobot. The signup process is really simple. You have to hit the Signup button and provide name, email, and password. There you go! They will send you an email for the verification. Once you click the link in the mail, you can access your UptimeRobot dashboard. You can add a maximum of 50 websites with the free plan. Along with the account, you get 2 months log to analyze the uptime performance of your site over time. The free plan analyzes your site every 5 minutes. When it comes to notification, you can choose the Twitter message, SMS, email, RSS and push notifications. I recommend you activate all the options as you can see at least one in case you miss others. The UptimeRobot is a complete monitoring solution with features to analyze HTTP, https, port, ping, keyword monitoring, and more. The premium plan starts from $4.5 for 50 monitors. As your need increases, you will have to pay more. With the premium package, you can avail 10 Pro messages, 12 months of log and advanced notifications. In case you want a bigger plan, UptimeRobot provides you with the same upon your request. Are you a WordPress user? Then I bet you have heard of Jetpack. It is a multipurpose WordPress plugin with tons of features. 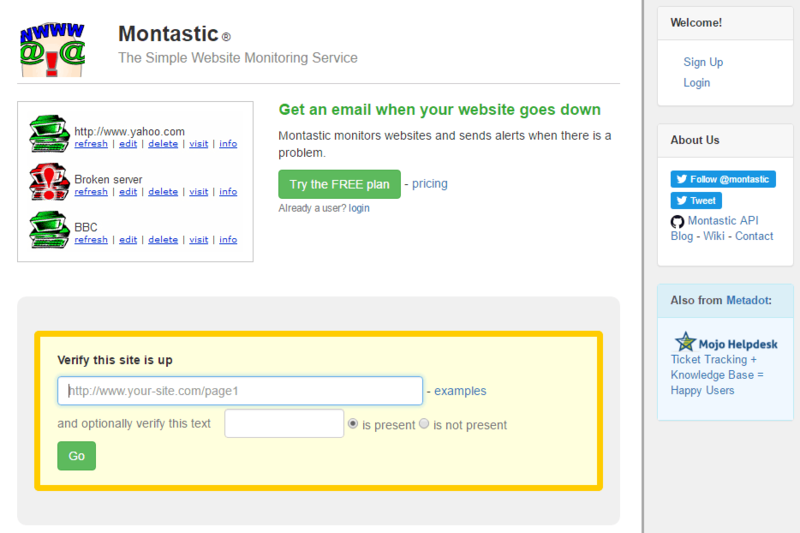 From Jetpack 2.6, WP users got a site monitoring service. If you are a WP user and don’t want to use a third-party service outside your site, Jetpack is the best for you. Yeah, there are both free and premium plans for you to choose from. Fortunately, all the projects include site uptime monitoring facility. You need to connect your WordPress.com account with Jetpack to make it functional. All you to do is, create a free account by visiting wordpress.com and then connect it with Jetpack plugin. After installing and activating the plugin, you have to enable Monitor from the plugin settings. You will get notifications to the email you used to register for WordPress.com every time your site goes down. Jetpack works well, and it analyzes your site only with an interval of 5 minutes. The notifications don’t take much time to reach you as well. In my opinion, this is the most convenient website uptime monitoring service for WordPress users, especially if you don’t want to get too technical. 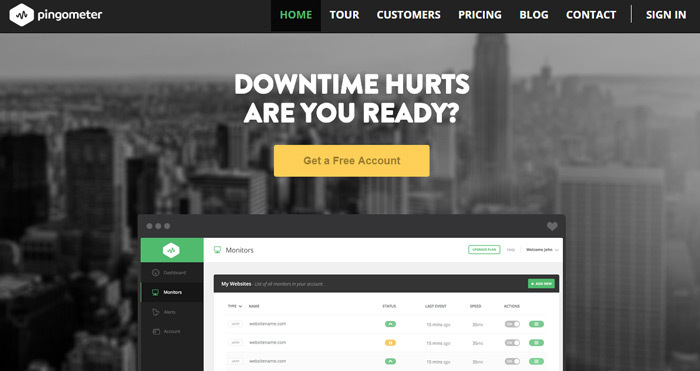 Pingdom is another one of the best website uptime monitoring services. Most people know it as a website loading speed checker rather than a website uptime monitor. Yeah, you can check how fast your site loads without paying even a single penny. Still, it is not the same case with uptime monitoring service. There is no free plan for that. You can make use of the 14-days trial period, though. There are five different plans for you to choose from under annual and monthly payment schedule. The former gets you some discounts. 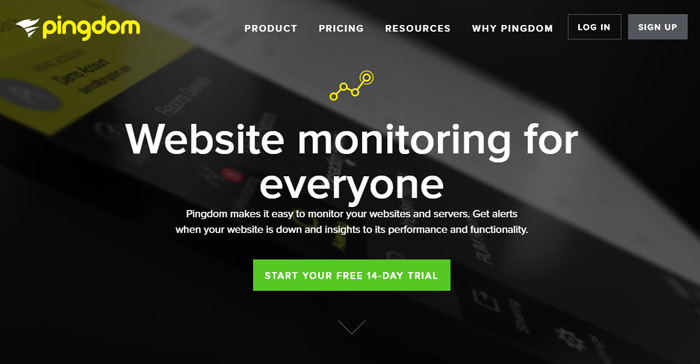 Pingdom checks your site every minute to give you downtime updates. Pingdom works in a unique way by taking feedbacks from the real users. So, you can get an idea of what they think about your site. The basic plan contains 50 SMS/ day. I am pretty sure that it is enough as our sites don’t go offline for more than 50 times in a single month if you’re using a best wordpress web hosting provider, chances are you might face only 2 to 3 minor downtimes per month. In case you face any issues with the monitoring, you can approach their customer support team via live chat without waiting for so long. The basic plan costs you $13.95 per month and checks your site through 60+ locations all around the world. So, you can check if your website is operating everywhere properly. Site24x7 is a freemium service, and with a free account, you can monitor upto 5 websites and 2 network interfaces. As a free member, you get very limited features. There are a bunch of features comes with the premium plans like you can check from 60+ locations worldwide. You’re allowed to check DNS, FTP, SMTP, POP, URLs, HTTPS, and SSL services all around the world through a private network. The basic paid plan starts from $9 per month using which you can analyze maximum ten websites. Site24x7 monitors your site every minute and gives you notifications via SMS or voice calls making use of your monthly credits. Basic plans only allow monitoring from eight locations. If your requirements are more, you need to go to a higher plan or contact Site24x7 support for a custom plan. 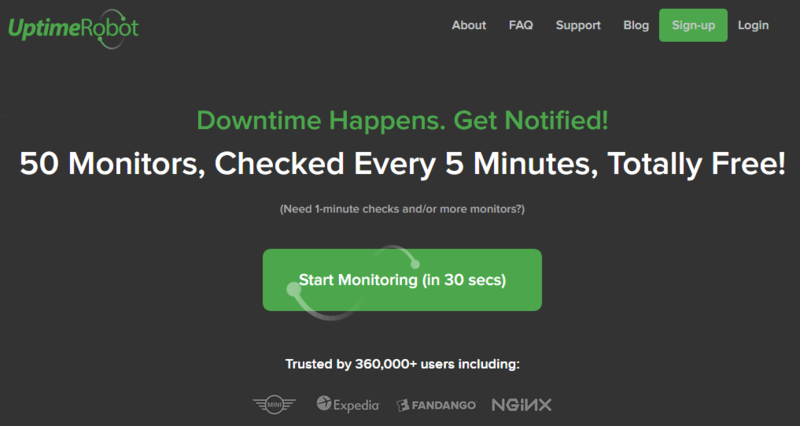 Pingometer is yet another freemium website uptime monitoring service just like Pingdom. They run their service around the clock to get you uptime reports real-time. The checking frequency (1- 30 minutes) varies from plan to plan. They offer 12+ locations. And, you can use them to analyze your site from different places. Given that some websites aren’t accessible from some certain places; the multiple locations help you a lot in this regard. They have a total of five plans. When you check their pricing section, you can see only four of them there. But they also offer a free package that helps you monitor one site from only one location. If you are just starting out or if you can’t spend money now, you can go with the free plan. The Small plan costs you $5 per month. You can monitor up to five websites without any issues. Their system will notify you when any of them goes offline. You can only get access to three locations with this plan. Data verification and SSL verification include in all plans except the Small. You can monitor POP3, IMAP, SMTP, API, RUM, HTTP, HTTPs, ICMP, DNS, and transactions using Pingometer. The downtime notifications can be got via phone call, SMS, email, Twitter DM, and web hooks. Pingometer provides detailed reports featuring the trends in availability, response time, performance, etc. You can subscribe to the premium plans using various payment gateways such as JCB, MasterCard, American Express, Visa Card, and Discover. 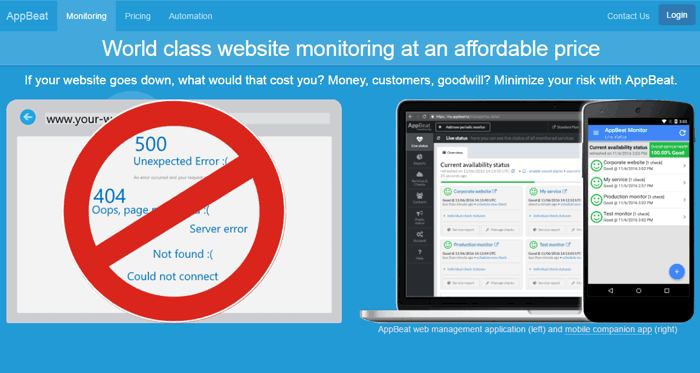 Are you looking for an all-in-one website monitoring service? Do you think it is impossible to get one for free? You are dead wrong! Yeah, you heard it right. There is an all-in-one monitoring service called Monitor.us that you can use for free. 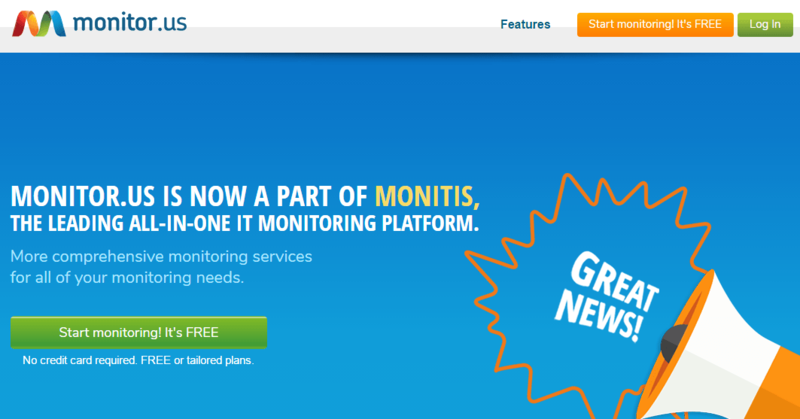 Monitor.us has recently merged with Monitis. Still, the features and functions remain the same. You will not believe the services of Monitor.us are completely free of costs. They enable you to check your site for downtimes every one minute. The historical archive is available for two years. Means you can analyze the trend in downtimes. In case your web hosting provider goes offline in any particular month or season, you can find out. There are multiple monitoring options like website monitoring, server monitoring, network monitoring, etc. The cloud-based service doesn’t want you to download any software or buy any hardware components. They notify you in different methods including Twitter DM, email, SMS, and phone calls. The best thing about them is the tailored paid features. You can choose specs based on your preference using the customized plan selector. Moreover, the 15-day trial helps you use all premium features without paying even a single penny. In case you don’t want to use the premium service after the trial period, you can step back to free plan as well. The name says it all! 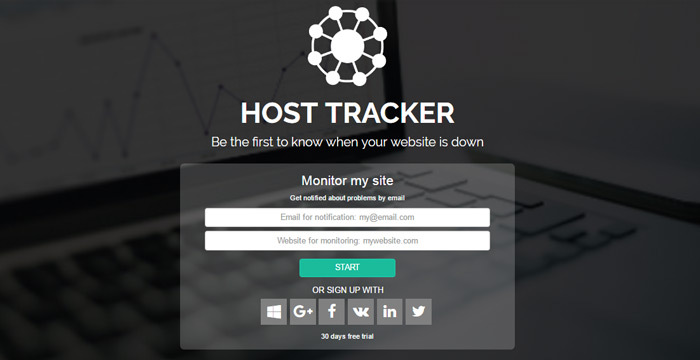 They keep track of your sites and notify you whenever any of them go down. Host-Tracker supports the wide range of protocols including HTTP, HTTPS, Ping, SMTP, SNMP, TCP, and Domain expiration and alerts you via multiple ways. You know what? Host-Tracker has a rich tradition of serving Kaspersky, Microsoft, Colgate, and Panasonic. The service came to life in 2004. Ever since the year, it has been relentlessly serving the customers. Along with the uptime monitoring, you can check response time, content, and database as well. One of the best things about the Host-Tracker is it notifies us regarding SSL certificate expiry and domain/IP blacklist issues. They have over 137 different locations to check. And, the notification methods include Skype, email, SMS, voice call, and Hangouts. You can subscribe for the free account and get a 30 days trial service to take some premium features such monitoring with the 1-minute interval. With free account (after 30 trial day), it checks your site with 30 minutes interval and maximum 2 monitors allowed. For the very basic plan (Personal plan), you have to pay just $3.25 per month and suitable for 5 websites. Isn’t looks one of the most affordable website uptime monitoring services? You can also take the benefits of this tool without installing any software on your computer as it is a cloud-based service and can be used from anywhere through a web browser. AppBeat is fairly a new service as compared to other website uptime monitoring services in this list. They offer both free and premium plans. The free plan helps you analyze three websites with 5 minutes interval. Unfortunately, you can’t get SMS notifications. In order to compensate the same, they give some third-party notifications (like Pushover, HipChat, etc.) along with regular emails. If you like customized notifications, you can use their API. Like some other site monitoring tools mentioned here, AppBeat has an Android application, which you can use on-the-go. They allow checking HTTP, HTTPs, HTTP/2, Ping, SSL, DNS, SMTP, POP3, IMAP, TCP, UDCP, and IPV6/4 or contact their support for custom alerting service. The free plan only saves historical data for a month whereas premium plans do it for a year. There’s a significant difference (5 minutes vs. 1 minute). So, if you really want to take care of your website’s availability, you should choose paid plan for all the great features they offer. You also get multi-login facility as well and integrate it with various third-party services such as Pushover, Slack, StatusPage, OpsGenie, PagerDuty, and HipChat. In case your monthly quota gets exhausted, you can purchase additional SMS or email. In a nutshell, you get a lot of features as a premium user. 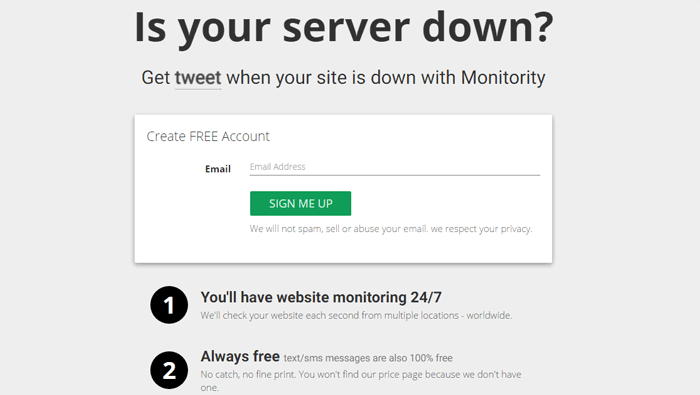 Montastic is also a free tool to monitor website uptime and downtime. Though the overall design of Montastic is very straightforward and easy to use, but in my personally view, they should re-design it and implement latest graphics to attract new users or customers. When we compare the features with other free solutions, there’s nothing much to boast about. The free plan of Montastic checks your site in every 30 minutes. Remember, there are services with 5 minutes checking frequency. You can always upgrade to their premium plan to have 5 minutes frequency. Whenever your site goes down, it will email you. The same happens when it comes online as well. Montastic offers something unique. They have widgets for both Windows and Mac. Means you don’t have to check your email or SMS inbox to get uptime notifications. Their widgets show whether your sites are online or not. You can verify the presence of a specific page on the web on the basis of keywords. The easy to use interface makes it a walk in the park to check the uptime and adding new sites. The free plan allows you to add three URLs to monitor whereas you can track 200 URLs with the most premium plan. The basic paid package costs you only $5 per month. You can upgrade or downgrade anytime you want. Not every one of us needs a fully functional and advanced site monitoring services. A basic one can satisfy most of us. Monitority is a completely free solution. You don’t have to worry about upgrading to a paid version because they have only one plan which is absolutely FREE. Visit their site, sign up for the free account and provide necessary details about the sites, URLs, or IP address you wish to monitor and you are good to go! You will be notified via SMS, Email, or even tweet when downtimes occur. In my opinion, this is the best free solution if you are looking for a reliable website monitoring service and can handle unlimited URLs without paying a single penny. Many monitoring companies charge money for checking your sites with 1-minute intervals and also for monitoring more sites than a specified limit. You can track numerous things like domains, HTTP, HTTPS, specific URL, or IP address with Monitority. Unlike some other free solutions, they render zero false positives and also has an Android and iOS app for better usability. You have got ten of the best website uptime monitoring services (both free and paid) now. What did you choose? If you are a WP user and want something to configure inside your site Dashboard, Jetpack is the best. 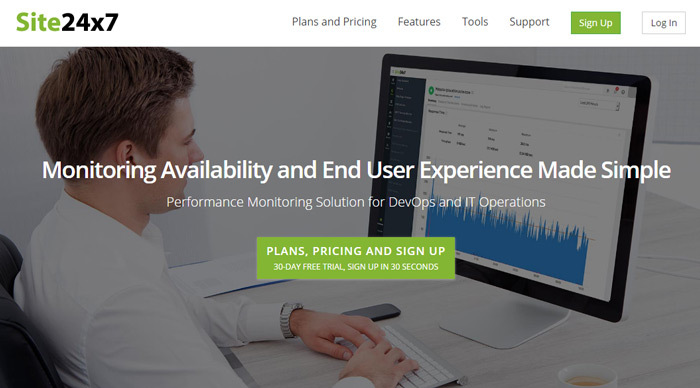 In case you want a free monitoring solution, Monitority is the best as it delivers even SMS notifications for free and unlimited websites checking. When it comes to paid services, you can choose any of them given here, I am using paid UptimeRobot plan for monitoring all of my websites. Before choosing any service, just compare the features with your requirements. Don’t forget to take the price into your consideration as well. I am sure that you will stumble upon the best uptime monitoring service for you.